We recently wrapped up a massive addition in East Cobb, and we wanted to share how their makeover story began. 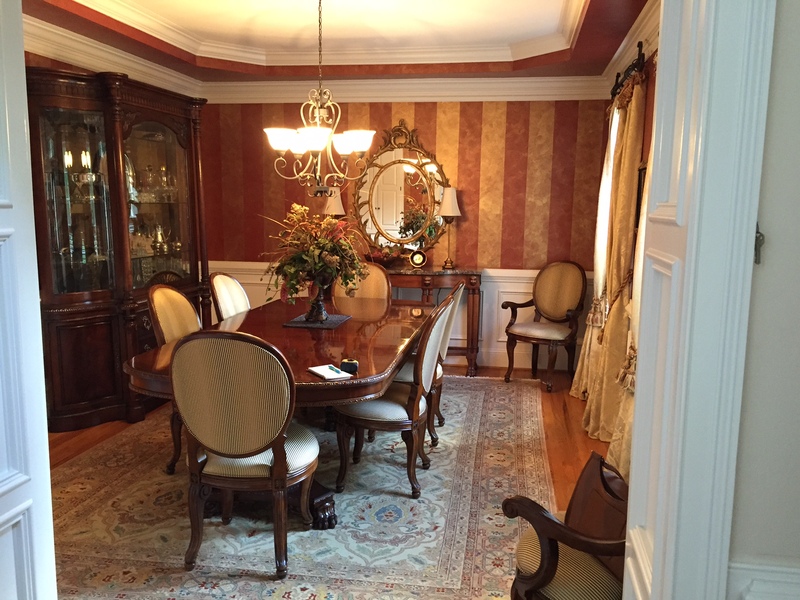 The clients initially found us more than a year ago after we wrapped up a remodeling project at their neighbor’s house. 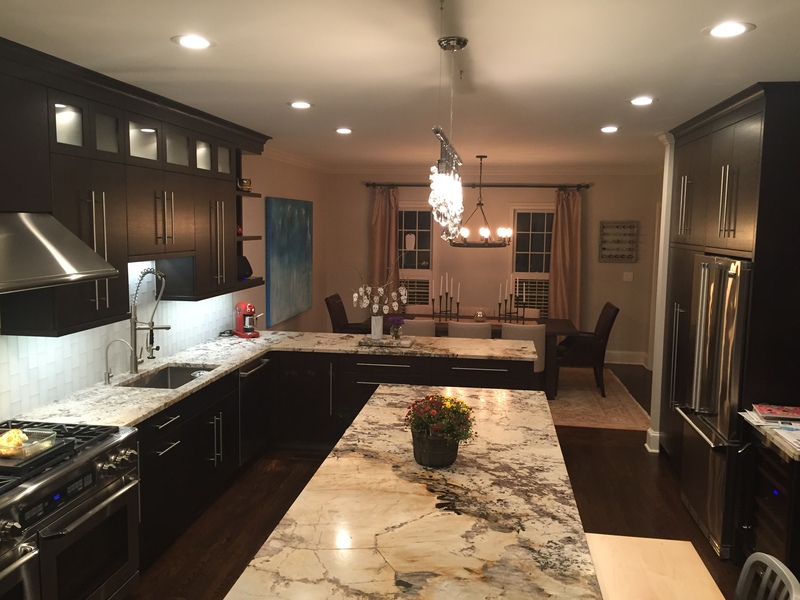 Upon its completion, we met and ended up creating a kitchen renovation for them too, which they adored! Fast-forward a year: knowing that their late 70’s small deck was beginning to age ungracefully, they began to ask us questions. Could an addition with two levels solve their spacing problems? Would an additional garage area for vehicles and equipment be feasible on their foundational footprint? Could that top floor have enough space for a screened porch, open deck, and kitchen extension? Yes, indeed! We assured them that with our careful planning and design, it could be done! We couldn’t wait get to work. Demolition was step one. We removed the old deck and began laying the supports for the new addition. We were using a solid, sturdy cedar wood for the deck flooring and screened porch walls, and we wanted it to last for generations. We stained both to match. It’s gorgeous in color and fits beautifully with the home’s exterior palette. The new kitchen extension included cabinets and quartz that matched their main kitchen renovation we completed last year. An addition of a wine cooler and icemaker were two more significant parts of making this a new place for entertaining. For the kitchen extension, we installed new Pella windows with custom benches. They wanted to bring the outside in with these big windows on the sides. You can look out and still feel the warmth of dinner cooking in the oven. It’s like having a small sunroom, but closer to the coffee! Sconce lighting was the perfect final touch. Every home is different, and for this project, a central screened porch was the best option because it allowed them to hear the sounds of nature and feel the breeze of the outdoors. We even used a beautiful porcelain tile for the porch that looks like wood; it adds durability and is easy to clean up. Outside the porch on the deck was enough space for a grill. They now have the new party house on the block! Pouring concrete to create a long driveway in the back was the last detail to wrap up the job. Plus, great news! A few days ago we received the Letter of Completion from Cobb County Inspections, the Chief Inspector himself came to look at the new addition for the last inspection. He shared that he, too, loved the project! Our favorite part of any job is having the final feedback from the client on how a renovation has impacted them. They shared with us that they are loving their new addition and are impressed with how beautiful and neat it turned out! Are you ready to start a renovation for your home? Atlanta Curb Appeal offers free estimates. We specialize in kitchens, basements, sunrooms, screened porches, outdoor kitchens and decks. Call to set up your appointment today! Go here to check out Renovation Gallery. Want to read another makeover story? Check out this Million Dollar Deck we did last year! Standard becomes stunning for this Atlanta Curb Appeal house makeover. From the outside, the building was similar to most homes built in the late ’80s, a two-story house in a friendly East Cobb subdivision. Like many of the homes, the interior had standard builder finishes, with traditional room layouts. What made the clients decide to get their house renovated? It was a recent purchase; they knew that the home was going to need help. It had the original carpets, kitchen the kitchen cabinets were dated, as were all the bathrooms. What was the big change they were looking to make? 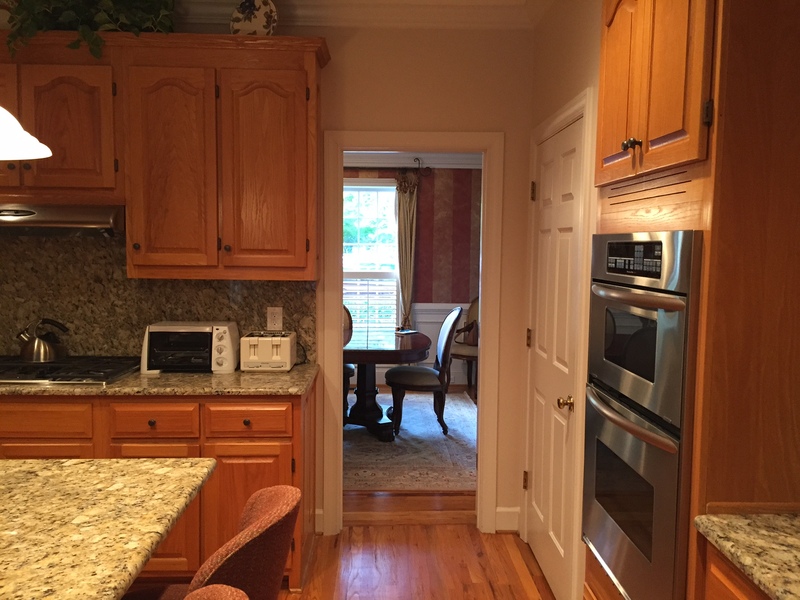 They wanted an open floor plan, new hardwood floors, a European kitchen, and all new appliances. What did Atlanta Curb Appeal do for them? First, we opened some walls and installed header beams. Header beams help to support the above weight and create the look of open areas. Broadening of the hallway to ease the flow of traffic to the living spaces. 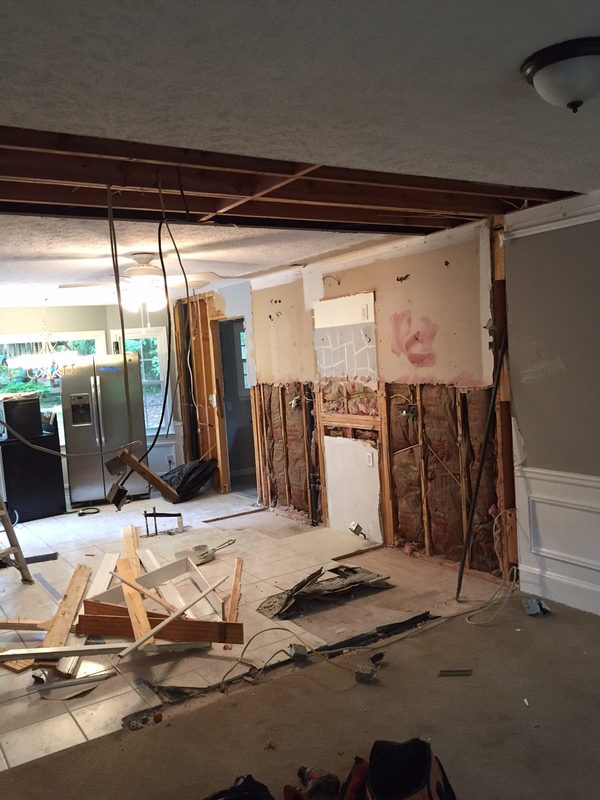 We also removed the long dividing wall between the kitchen and dining area, allowing a vast and open space. 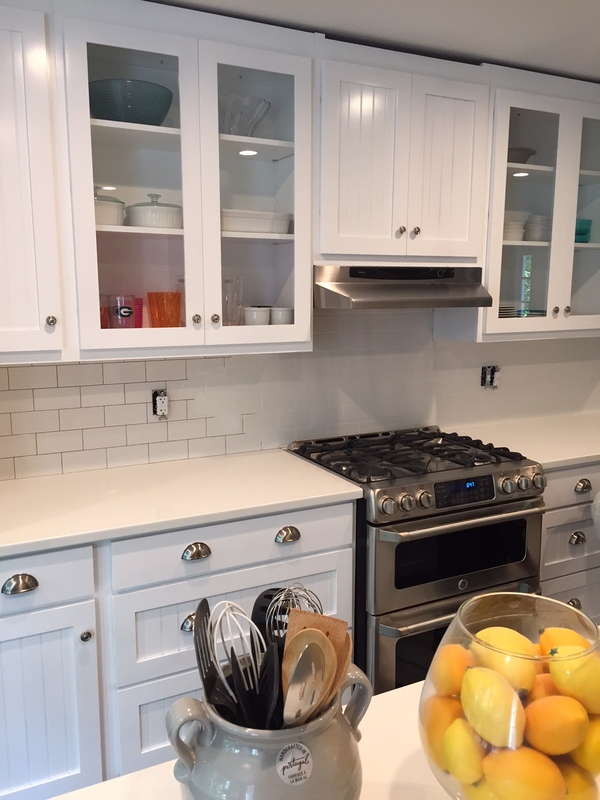 Consequently, this significant change required us to re-route all the electrical, plumbing, and gas systems in the kitchen. New paint and hardwood floors were next on the list. 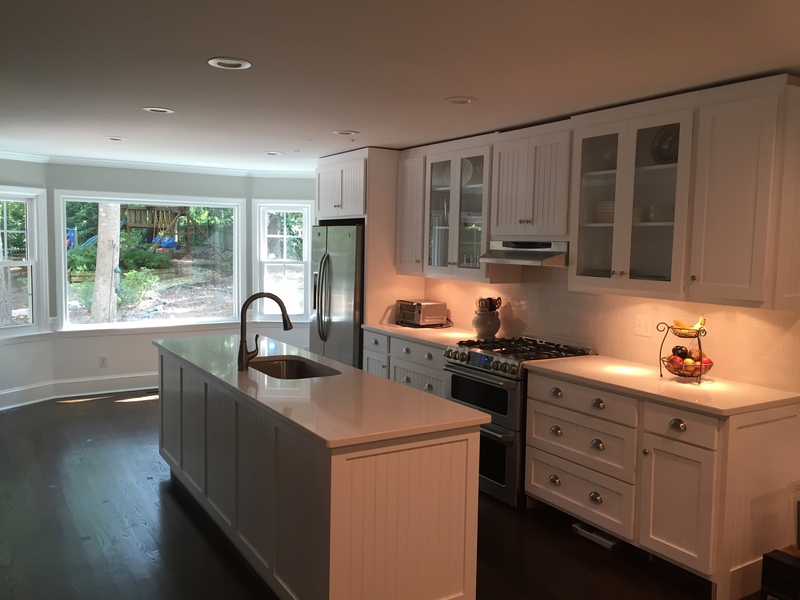 Custom-made cabinets, lighting, and a new island transformed the space into a designer-styled kitchen. 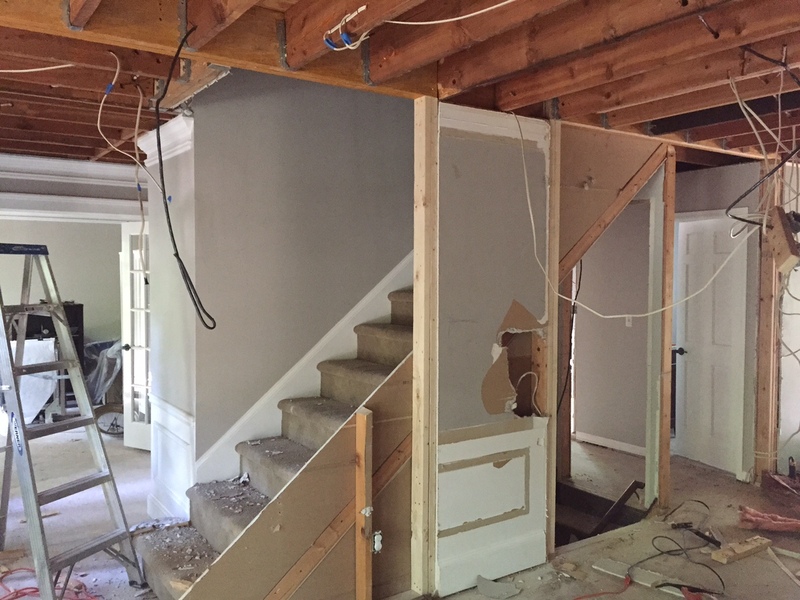 Next we started demolition of the living room wainscoting and wall cabinets. The fireplace got a makeover too! We resurfaced it with marble tile all the way to ceiling and added a custom reclaimed wood mantel. 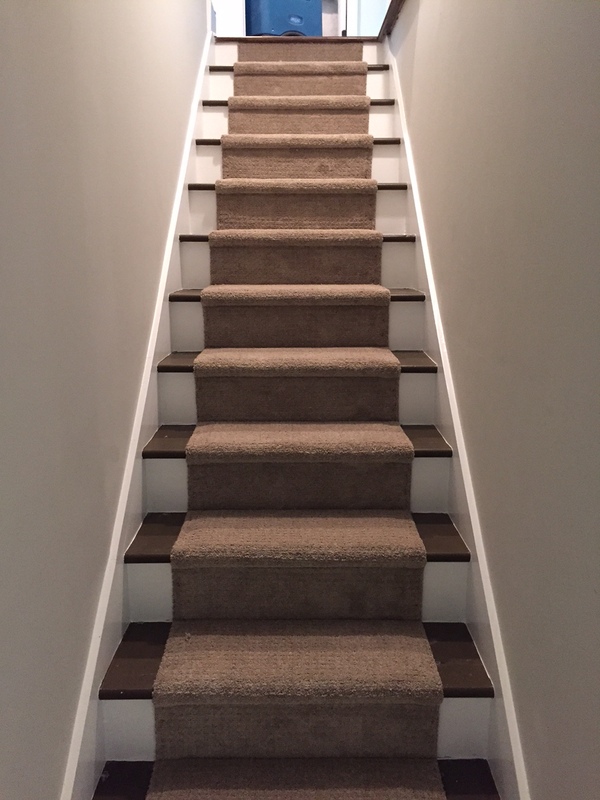 New oak stairs, new custom oak handrails, and square aluminum balusters completed the main and second floors. When you are working on a renovation of that scale, what is the first step? Demolition is always first. Then comes moving the walls and installing support beams. It’s best to get the messy, dirty stuff out of the way. Always remember to change HVAC filters frequently during the renovations. How did you pick out the finishes? The clients enjoy design and European aesthetic. With help of ideas for architecture magazines, Pinterest and Houzz, they came up with their vision. We helped them identify materials needed to meet their vision. The results were dramatic and beautiful. Why did you choose some brands over others—was it the price, quality, etc.? We did a lot of research with the client and figured out which manufacturers had the best-quality items using the budget we had set up originally. What is the most custom part of the entire renovation? There were a few areas where they requested a special touch and attention: the railing system, the barn door and closet in the master bedroom. Did your encounter any surprises? Getting the big oven hood in the kitchen to vent outside properly took more time than we expected. Reconfiguring the plumbing and the HVAC ducts that were hidden inside the removed walls ended up taking more time and effort too. What has been the biggest change that the client has enjoyed so far? The large, open concept kitchen and dining space with the long island that is also open to the living room. They also love the leathered granite that they selected. It is extremely unique and is a great conversation piece. 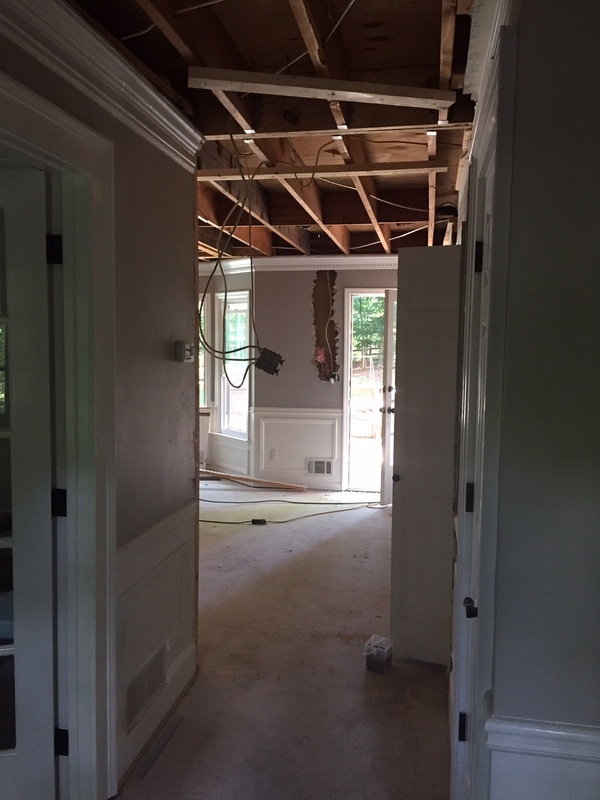 This is part one of a four-part series about this East Cobb Whole House Makeover. We will look at the masters bedroom and bath in our next blog post. Thanks for reading. Check out our beautiful online gallery! Avi Moyal and Andy Anderson. The birds are chirping; the sun is rising, and in this Marietta Square neighborhood, breakfast is being served outside. A handsome pergola by the pool towers over the table as a family starts a new day. A few months ago, this structure was a simple idea on paper; today it’s a reality thanks to Atlanta Curb Appeal. Homeowners sometimes ask, “Do pergolas have a purpose; are they purely ornamental or do they actually provide some shade?” The answer depends on how close and tight the top structure is. The closer the roof boards are, the more shade you will get. The board spacing is determined during the initial client meeting since pricing is a factor – the tighter the gap between boards, the more material is needed. Commonly, people want to install a pergola in their backyard to add a decorative architectural element. The intent of this project was to complement the client’s swimming pool patio. Wood selection is another important determinant for a pergola design. For this particular project, cedar was recommended. Cedar wood has exceptional qualities for outdoor projects. For example, it’s easy to work with, and although light in weight, it is strong and durable. Staining can be performed immediately, unlike pressure-treated pine, which requires a waiting period. It is resistant to pests, smells great, and has a long life. Cedar is also resistant to rotting and can handle a moist environment, which is important when you are next to the pool. It is more expensive than other wood types but worth every dime when thinking long term. After the build, the client chose not to stain the wood. Cedar ages beautifully in its natural state. First, it slowly turns to a graceful gray. Some elect to seal at this point; however, if allowed to mature, the color evolves to its final magnificent dark brown. Pergola designs are typically standard in structure, simple columns and a slatted roof. Atlanta Curb Appeal, however, enjoys adding artistic elements and has never received a design too challenging. This client’s project was unusual because of its proximity to the pool; the arched shape of the roof allowed for a single side of main supports due to the pool’s cement foundation. If you’ve been dreaming of the perfect pergola for your back yard, get a free consultation from Atlanta Curb Appeal today. Want to read another makeover story? See our full gallery on our website. Recently Atlanta Curb Appeal was able to give back to the East Cobb and North Georgia community by participating in a special way, by helping the Anna Crawford Center of Cherokee County. They put on an annual light display called, “Holiday Lights of Hope.” Over 25,000 people attended last year. The Anna Crawford Center is a nonprofit, community-based organization that works to break the cycle of child abuse through prevention and intervention services. It is an amazing foundation and Atlanta Curb Appeal was glad to volunteer our services. How did you connect with Holiday Lights of Hope? We are the second largest client of the East Cobb Home Depot store. We have a long and healthy relationship with the employees and the managers at that location. Who participated in the build? Andy, Rudi Anderson and myself [Avi Moyal] were there that day. How did Atlanta Curb Appeal help? They asked us to help with the roof and structure build out. The Anna Crawford Center and their suppliers provided everything else. We were there from Friday morning until dark. We worked hard, but we enjoyed ourselves immensely as you can see by the pictures! How did it make you feel to participate in such a project? We were thrilled to be invited to help this important cause. Of course; we accepted, and I immediately blocked the date for Andy and me in the calendar. Honestly, even though we are very busy right now before the holidays, we felt in our hearts that it is much more important to help others including our bigger supplier, Home Depot. Are there plans to participate in more projects like these going forward? The Home Depot of East Cobb is a very well organized store with an amazing team. Ryan Leblanc, the store manager, is an outstanding manager that assists us greatly with most of our supplies and deliveries. Their store handles many ‘volunteer with friends’ activities. If we get invited again, we will happily join in! 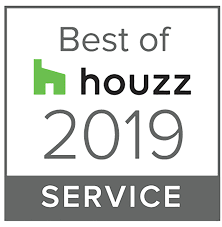 We Got to Be Their Remodeling Hero! How Did Your Client Find You? It is the strangest story! Her renovation contractor didn’t show up on Day 1 of her renovations. She quickly got on an East Cobb Mom’s Facebook group and asked for advice on what to do. Atlanta Curb Appeal was recommended. We met her in a day, agreed to a plan of action and we had our crew start work the next morning. Our client said that it was quite a whirlwind.She was thrilled that within 14 days, her home renovations including bathroom remodeling were completed! Was it a small project since it only took two weeks? What are the benefits to having Bamboo Hardwoods? Bamboo flooring is known for its strength, durability, it’s eco-friendliness and natural resistance to insects and moisture. Bamboo hardwoods are not much more expensive. It is not popular with homeowners yet, but its interest is growing. One caveat is that it should only be used in areas where there is not excessive moisture. That can damage it. Tell us about the Master Bathroom Remodel. The master bathroom turned out beautifully. It was complete makeover! Everything was demolished during the demolition phase and built from the ground up. We put in new bathroom floor tile with coordinating wall tile around the shower and tub. Then Atlanta Curb Appeal installed frameless glass shower doors, which are very popular. The client chose white shaker style vanities and lighting throughout. The new lighting required a fair bit of electrical work. We then finished off the bathroom remodel with mirrors, towel bars, new paint, and baseboards. It is truly a brand new space. You wouldn’t recognize it from the before pictures! Why did they want to update their home, did they have problems with the layout? No technical problems existed; they were just ready to upgrade the look of the original house. Are they happy with their finished home? Absolutely! They sent us a thank you note (see below) and have already referred us 3 new clients! We are so happy that we could make their dreams come true on time. Here is just one of the testimonials they sent us. We just wanted to touch base with you and let you know how much we appreciate all of the hard work you have been putting into our house. Sometimes it’s easier to gripe on the bad not knowledge all of the good. We hope you know how much we love all of the wonderful things you have done for us and our home. Although this has been challenging at times, you have made this experience a very bearable endeavor. This journey would definitely not have been possible without the two of you. Your guidance and expertise are one in a million. You have said from the beginning to buckle up, so thank you for taking us on this journey called home renovations. You are making our dreams a reality by turning our house into our home. So from the bottom of our hearts thank you!!! Looking for more Kitchen Remodeling Ideas? Check out this blog post about a we did last month. Stunning! Modern Kitchen Remodel That Will Blow Your Mind!! 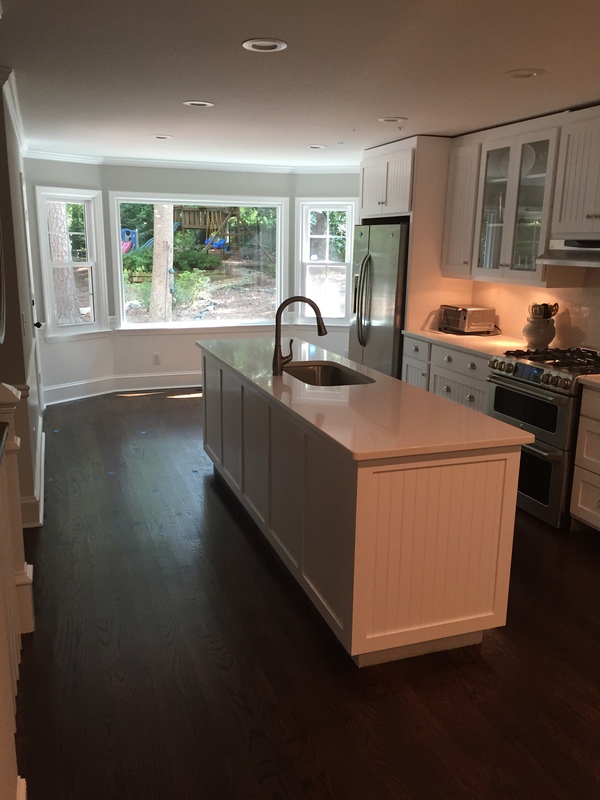 This month we discuss a project with Avi Moyal, owner of Atlanta Curb Appeal, a total kitchen remodel recently completed in East Cobb. What made the client decide to get the kitchen renovated? The couple had recently purchased a home. Before they even moved in they knew that they were going to have to make some major changes. The house was very traditional and had not been updated since the 1980’s. The client’s personal style was very distinctive, very modern. After talking with them we realized their vision was leaning towards a more open floor plan to achieve an ultra modern feel. It would need clean lines with light colors in the background. Doing this would allow the contemporary features to stand out. The brightening would also showcase the client’s personal collection of artifacts. What was the process like? Was it difficult since it was so dramatic? Yes! The demolition phase was long and messy. This was followed by the reconstruction stage, which included adding support beams. Since there was so much new fabrication, we had to add new electrical and HVAC ductwork. Even the plumbing was changed out and re-routed. This is typical when you move walls. How does the kitchen flow differently now? It is so smooth now because the dining and kitchen walls were actually knocked out completely. The foyer hallway passageway was then widened. Plus the openings from the kitchen area to the living area and back room were changed too. All the railing in the house was replaced too. 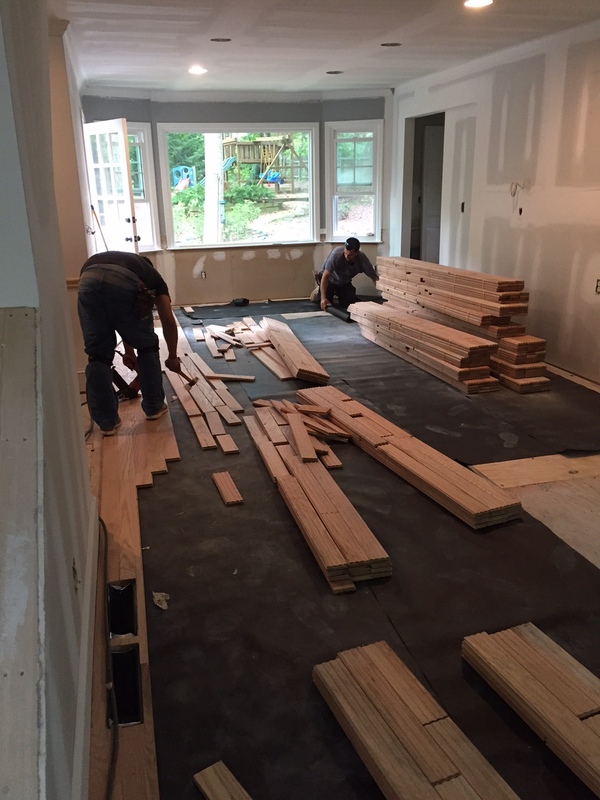 Gorgeous new hardwoods were also installed. The last part of the puzzle was all new paint. What are the new features that impress guests or neighbors when they see it? In the kitchen it is the new custom made cabinets that were cut by a CNC machine and hand-made by a European cabinetmaker. The all new appliances (Viking, etc) and gorgeous granite that was leather finished is a total jaw-dropper. Another favorite is the renovated fireplace; it was a completely made over with true marble, tile to floor and a new custom mantle. The whole project from start to finish was two months with intensive daily work from a few crews in parallel. What should clients expect when they tackle such a huge kitchen remodel? Plumbing and electrical changes can be a challenge especially when you move walls and the location of the appliances. How do the clients feel with their new kitchen? The clients are super happy with the end results! Especially since it was all done so quickly, on budget and with such a fine high quality finish. Thank you for reading. If you are considering a new kitchen remodel then call Atlanta Curb Appeal for a free estimate. 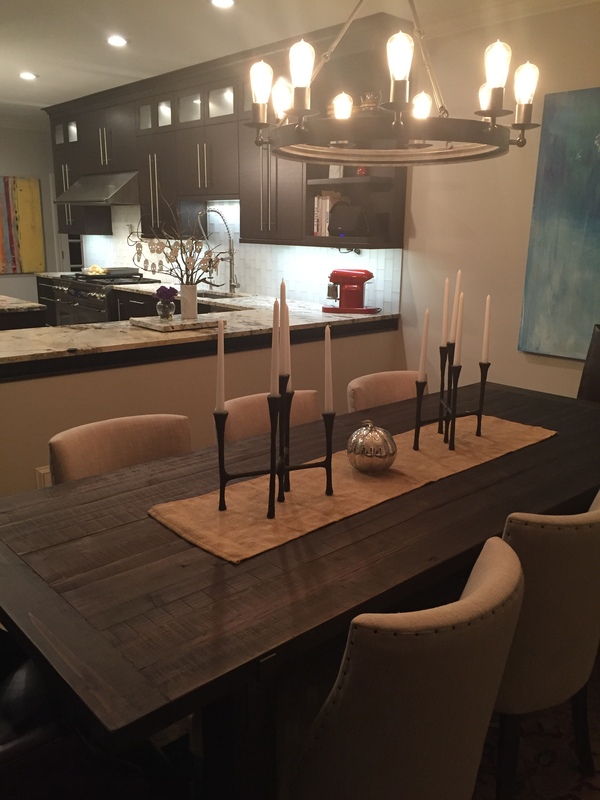 Check out our gallery on our website to see more beautiful AFTER pictures! Want to read another Makeover Story? 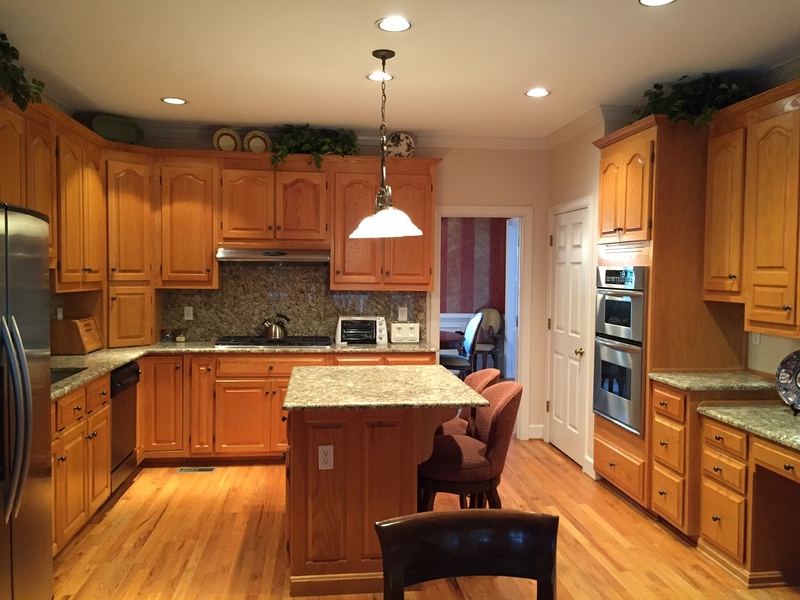 Read here to see this kitchen makeover we did which included new granite countertops. Where was this project and how did they find you? East Cobb, Georgia. They found us on a private East Cobb mothers group Facebook page. What was their kitchen like before? The kitchen was completely different; it was small and tight with a totally different layout. 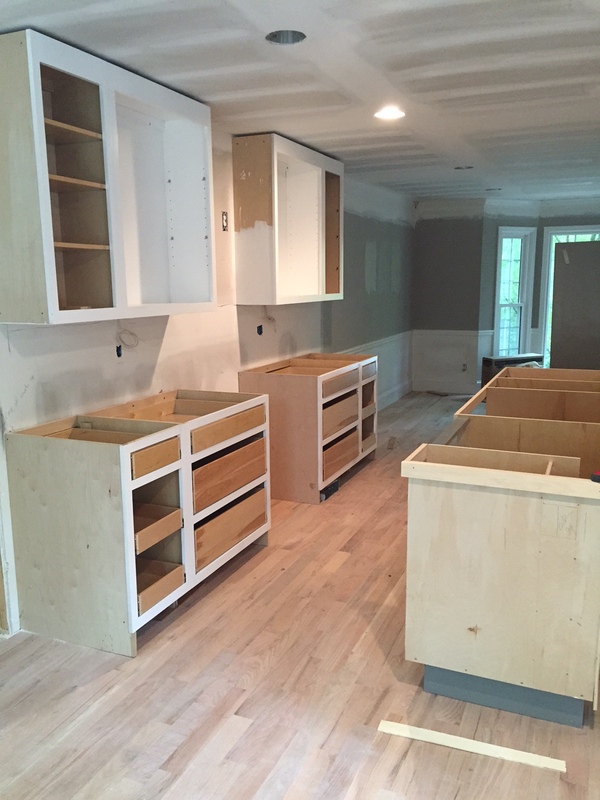 Share about the kitchen remodeling process. First we gutted it, then took off the stamped ceilings and did a lot of re-wiring for the can lighting. We then installed new smooth ceiling drywall. We also took down the whole wall between the dining room and the kitchen and relocated all the AC vents and returns. In this process we had to do a lot of relocating of electrical outlets and switches too. The gas line for the gas range had to be moved as well. Above the stove we cut into the exterior brick for hood venting. The client picked out all the cabinets and faucets. Tell us about the new lighting in the kitchen. Can lighting is becoming more fashionable and we have been installing more of these flushed lighting systems each year. These new lighting kits are energy efficient LED lighting. Can lighting keeps the ceiling nice, clean and smooth white. Would you say that kitchen islands are becoming common these days? People love kitchen islands. For many homes the kitchen is the new center of entertainment. What else did you do to the home? We did the whole main level of the house and half of the basement. We widened four sections of the house to create a modern open floor plan with wide openings between each area. One of the main areas we exposed was between the stairs going up the bedrooms and down into the basement. We added a railing for safety. 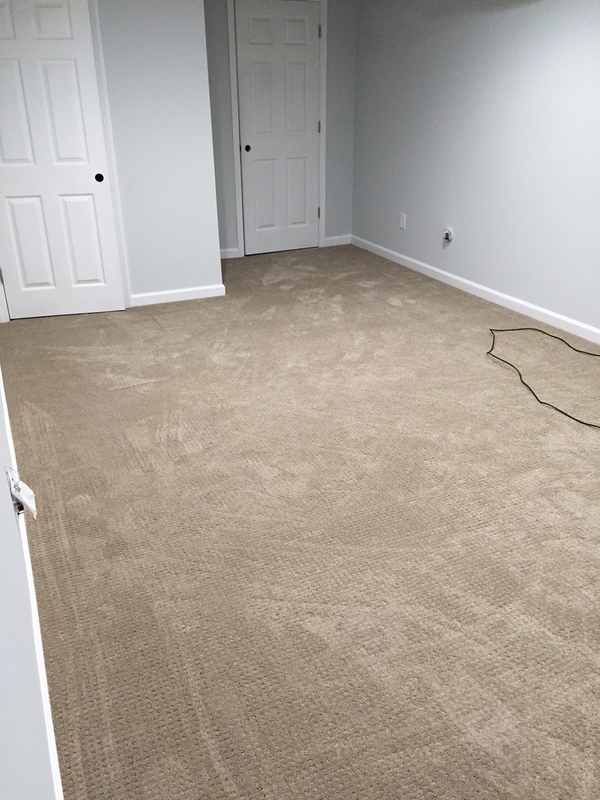 Finished the basement with drywall and new carpet. While we were down there we added a bathroom, air conditioning and painted the interior too. The floors were installed during the most humid days of the year and we had to wait longer for the polyurethane to dry between each coat; which slowed us down. The owner was about to give birth to her 3rd child and we had to beat the schedule! What has the customer said about the project? They are very happy with the end result and have already recommended us to others! What did they say about their experience with Atlanta Curb Appeal? What is their favorite part? They loved the way everything is now open and the new flow of their house. 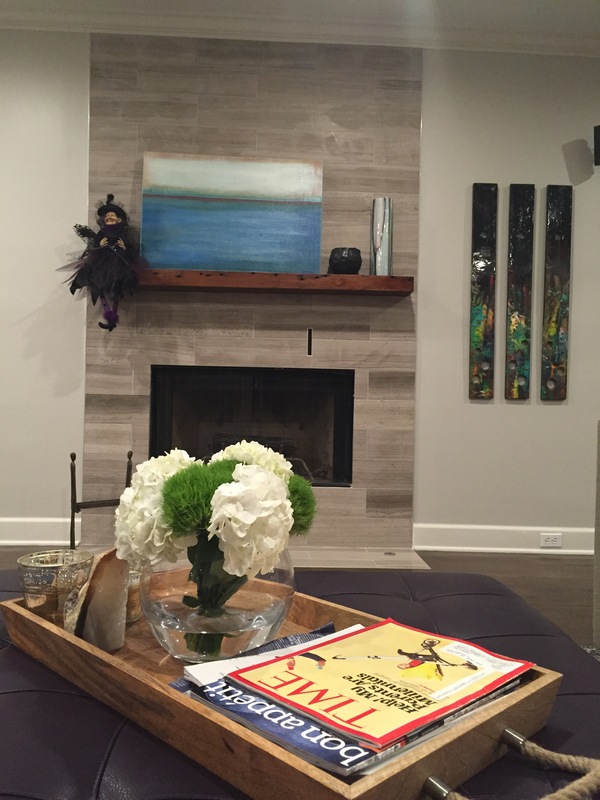 It’s amazing how much tranquility a renovated home can bring to the family dynamic. The kids adore the new basement playroom. Thanks for reading! 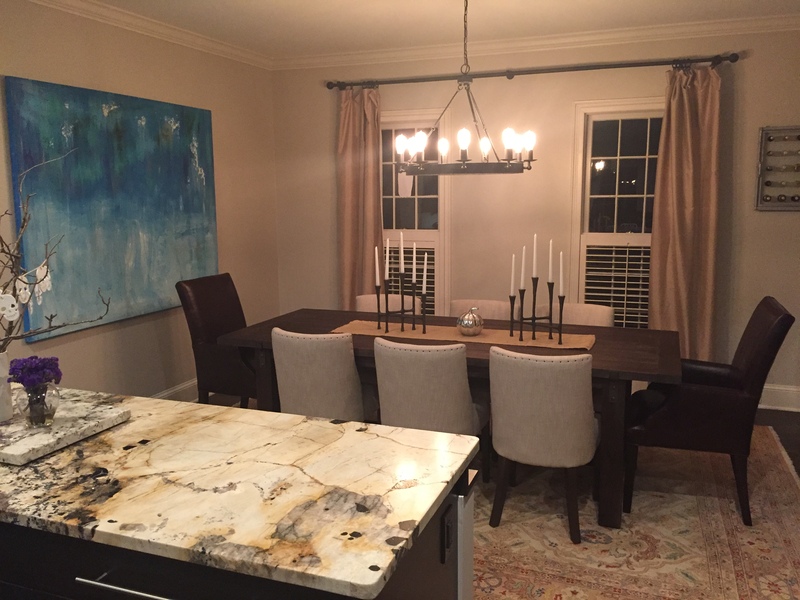 Want to read more, check out our post about another transformation of an East Cobb home remodel we did in April. Atlanta Curb Appeal offers free estimates. Check our online gallery for more pictures. Want to read another article?